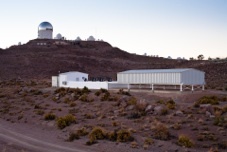 The MEarth Project consists of two robotically controlled observatories. 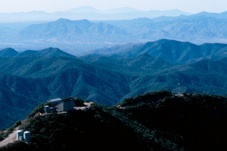 The MEarth-North telescope array observes from the Fred Lawrence Whipple Observatory (FLWO) on Mount Hopkins, just south of Tucson, Arizona. 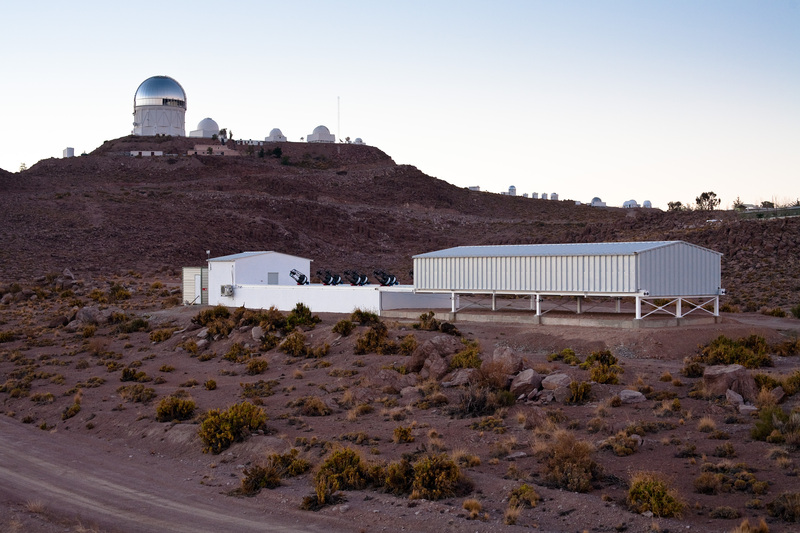 The MEarth-South telescope array observes from the Cerro Tololo Inter-American Observatory (CTIO) on Cerro Tololo, just east of La Serena, Chile. 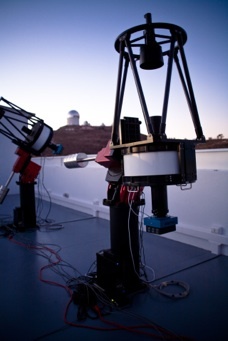 By having observatories in both the Northern and Southern hemispheres, we can cover the entire sky in our search for exoplanets transiting the closest M dwarfs. 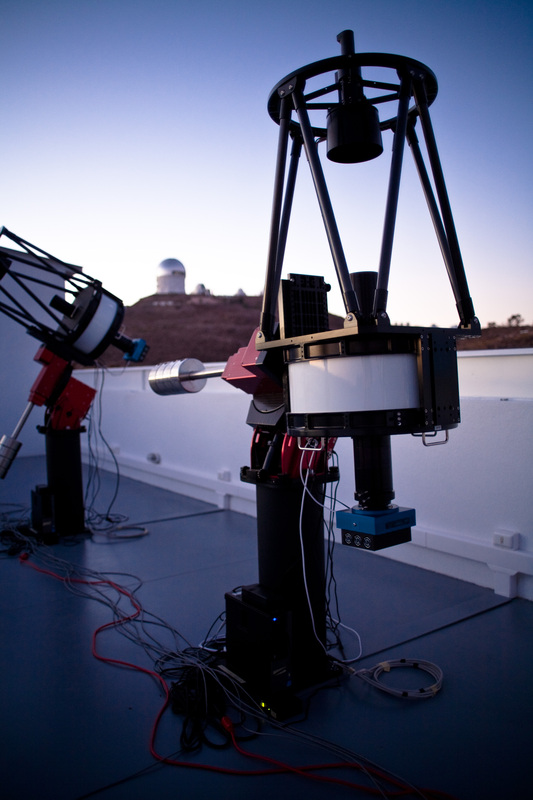 Both arrays of telescopes are controlled remotely from our offices in Cambridge, MA. On a dramatic ridge in the Coronado National Forest, the MEarth-North observatory is housed in single enclosure with a roll-off roof on Mount Hopkins, AZ. 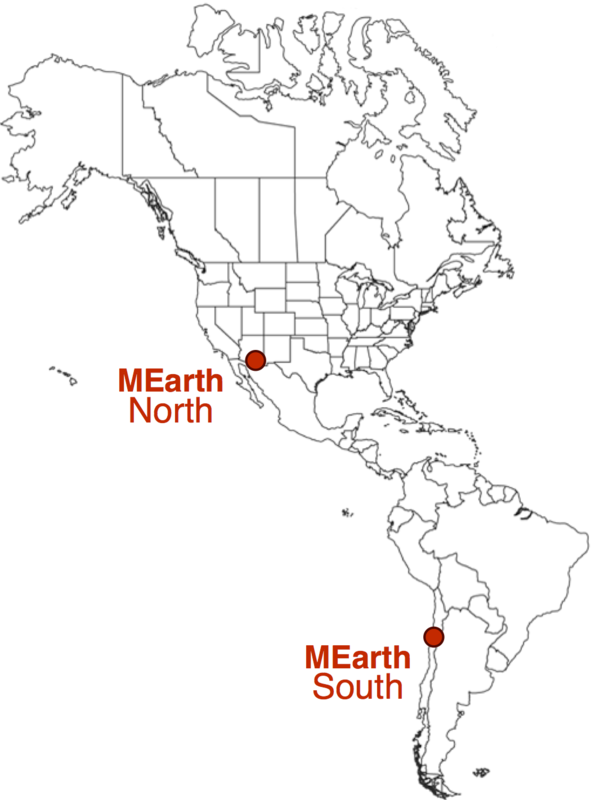 The MEarth-North telescope array has been active since 2008. 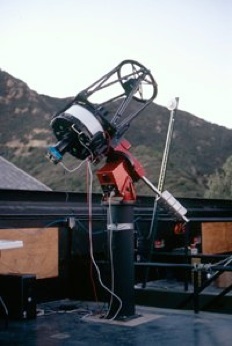 The MEarth-North observatory consists of eight identical telescopes. On each telescope, a 0.4m primary mirror focuses starlight onto a high-grade CCD camera that records the infrared brightness of each star. By measuring the brightness of a star many, many times, we can search for dips that may be caused by planets blocking some of the star's light. 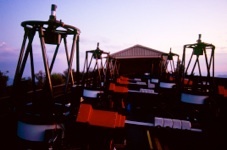 We use eight telescopes so we can observe more stars at once. The telescopes are robotically controlled and can take hundreds of observations each night without any human intervention. 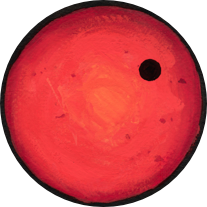 To see the telescopes in action, click the black-and-white thumbnails below to watch time-lapse movies of MEarth-North, in which entire nights of observations have been compressed into just a few minutes. 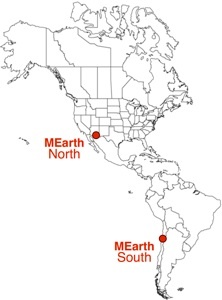 The newly constructed MEarth-South telescope array began taking regular observations in early 2014. Under the clear skies of the Chilean desert, MEarth-South open up the entire southern hemisphere into our search for interesting new exoplanets transiting the closest, smallest stars. 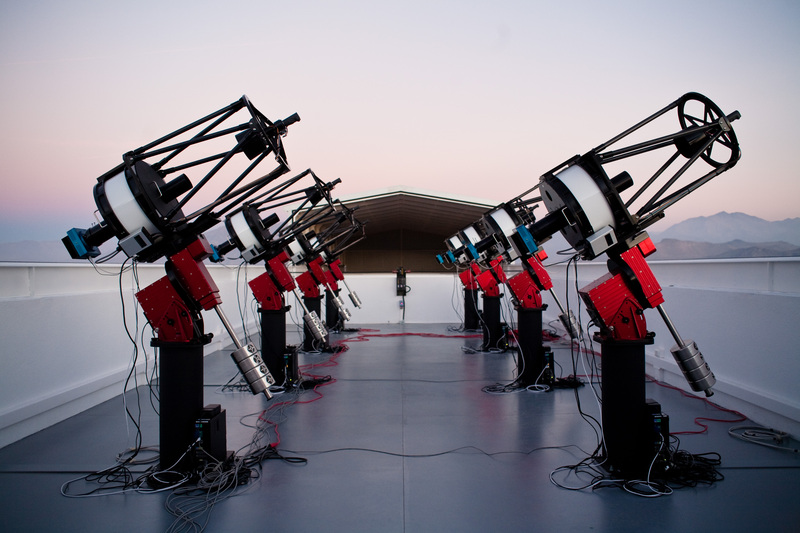 The new MEarth-South array consists of eight additional 40cm telescopes, each equipped with a CCD camera sensitive to red optical and near-infrared light. 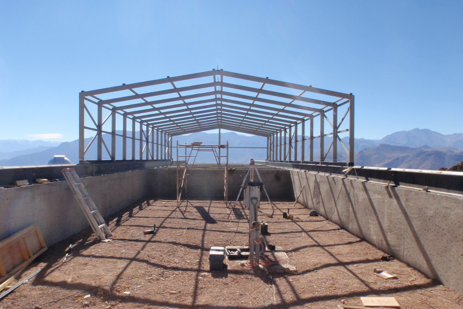 All eight telescopes are housed in a large enclosure with a roll-off roof, a building that we designed and built specifically for MEarth. The telescopes and cameras are nearly identical to those in the original northern array, but with numerous subtle modifications to optimize performance based the lessons we learned from MEarth-North. By importing the well-tested robotic software controls and analysis tools already developed for the northern array, we have been able to take full advantage of MEarth-South's photometric capabilities, right from the very first night of observations. 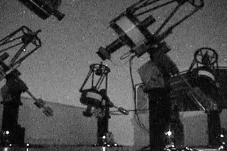 Click the black-and-white thumbnail to the left to see a time-lapse movie of the MEarth-South telescope array in action. Each telescope observes its own set of M dwarfs throughout the night, scouring the skies for new transiting exoplanet systems.